Field service firms are standing at the edge of transformation with the dynamic technological advancements taking place and demand for a ‘right solution’ to automate business processes, generate maximum revenue and improve productivity. 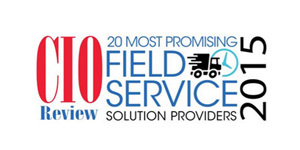 To help companies find the right solution provider, we present you CIO Review’s 20 Most Promising Field Service Solution providers 2015. CartoPac International Provides best-in-class GIS enterprise solutions and management of companies’ critical field assets. ClickSoftware Technologies Automated workforce management and optimization solutions for the enterprise. Cotap A provider of mobile apps that facilitate secure, convenient mobile communication for Field Service Teams. Customer Service Delivery Platform The company integrates field service, reverse logistics, and customer service software to provide end-to-end service lifecycle management solutions. Field Squared A developer of Field Service Mobility apps that cater to the specific needs of firms in both residential and commercial industries. FieldAware Provides Cloud-based mobile software for companies looking to transform their field service businesses by automating processes and streamlining operations. Level 10 Level 10 is one company, everything IT. The company creates solutions that allow for an easy and enjoyable work life. Marketing G2 Mobile Concierge is a key component to a comprehensive engagement platform that encompasses e-Commerce solutions, customer billing and revenue recapture, customer self-service portal, customer identity and entitlements, and campaign management and analytics. MSI Data Develops software that enables companies to improve the efficiency and effectiveness of their field workforce. Patrol-IT Providing organizations with complete field worker management and supervision solutions. Penta Technologies Enterprise construction and field service software that improves efficiency and overall effectiveness. Service Strategies Advances service excellence by providing industry standards, career development, and strategic advisory services. ServiceLink Field Services, LLC A field service company dedicated to assisting mortgage servicers in satisfying loan servicing requirements in a challenging regulatory environment. ServiceMax Powering a new era of field service experiences for our customers' customers.